On Saturday May 21st, the ECLJ had the pleasure of hosting a reception and a conference for Mgr Nicodemus Daoud Sharaf, the Syriac Orthodox Archbishop of Mosul. At the invitation of the Mission of the Holy See in Strasbourg, its Permanent Representative to the Council of Europe, Mgr Paolo Rudelli and Dr Grégor Puppinck, Director of the ECLJ, received the Archbishop to show him support and give him the opportunity to bear witness in Europe to what Christians from Iraq suffer. He was the very last Bishop to leave Mosul in June 2014, when the city was taken by ISIS. After a few words of presentation at the reception in the presence of various representatives at the ECLJ’s office, including the ambassador of Poland, Mgr Nicodemous Sharaf gave a conference in front of more than 200 people. He vigorously called upon the ECLJ and all citizens to ask their governments and international institutions to act in order to permit their return to Mosul and the Nineveh Plains and to reestablish a Christian home under international protection. “Sunnis, Shiites and Kurds: they all have got their territory. Christians, he asked, must also have a right to live in peace, they need a secured home”. They wish they could come back in the Nineveh region where many Christians were living until June 2014. Archbishop Sharaf insisted that “powerful countries may stop ISIS if they want to. 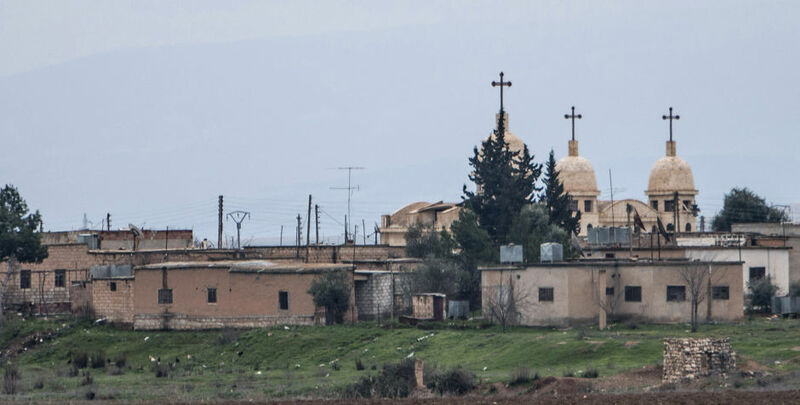 The creation of a safe area for Christians to come back is achievable if the international community supports and protects such an area. He also described the difficult living conditions of the refugees: about 5,000 refugee families around Erbil, in Iraqi Kurdistan. Mgr Sharaf deplored the destruction of families and communities provoked by this genocide and the exodus. He affirmed that “the demon first attacks the families to destroy people and the church.” As long as families are strengthened and united, love, life, faith and culture may be transmitted, thereby ensuring the continuity of people and the church. Interestingly, Mgr Sharaf reported that no single Muslim defended them when they were offered the choice between converting, leaving or dying. Even his neighbor, to whom he generously provided electricity for years, was the first to destroy the cross at the top of the cathedral. He told all the French audience that we should not trust Islam and that Europe should not be naïve about that religion. He concluded his speech by calling Europe to keep its Christian soul alive and to the French people: “defend your country otherwise they will take it from you”. The ACLJ and the ECLJ are deeply committed to the international recognition of the genocide ISIS is perpetrating. Our ACLJ and ECLJ petitions for the recognition and action against the genocide have gathered over 574,000 signatures. The European Parliament, the Parliamentary Assembly of the Council of Europe and the Obama administration have eventually recognized it. Now, our organizations will act at the UN for the official recognition of the genocide too and for the institution to take measures so that Christian refugees may come back home with an international protection.